Quiz: How much do you know about Disney Cruise Line? 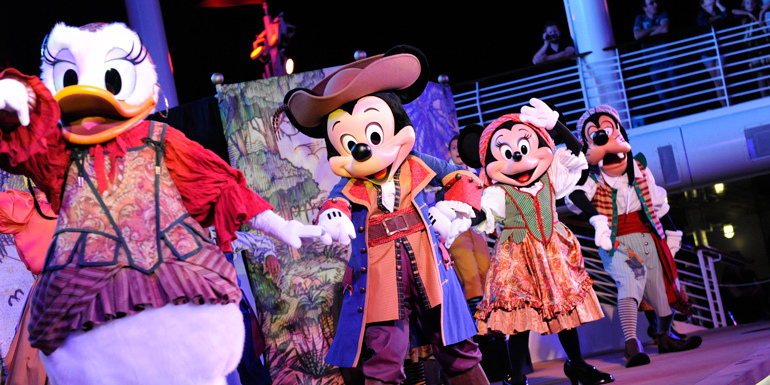 Think you know everything there is to know about Mickey's fleet? Prove it with our 10-question quiz! 1. How many captains can you find on each Disney Cruise Ship? 2. The horns of the Disney Cruise Line fleet play the first 7 notes of what famous song? 3. What inspired the design of the restaurant Palo? 4. What first-in-the-industry feature set Castaway Cay apart from other private cruise line islands? 5. What is the name of the waterslide found on Disney Fantasy and Disney Dream? 6. What Disney characters can be found on the stern of the four Disney cruise ships? 8. When Disney Cruise Line wanted to paint this part of the ship a special color, they had to get special permission from the US Coast Guard. 9. At which Disney restaurant can cruisers be treated to both dinner and a show? 10. What Disney character inspired the colors of the Disney Cruise Line fleet?